LAHORE: The Ministry of Home Affairs has extended the visa of an Indian national Kiran Bala for the next six months. Approval for the visa extension of the woman, who after converting to Islam has taken the name Amna, was granted. The Pakistani husband of the Indian national has confirmed the news that his wife’s visa has been extended for six months. “I will receive the passport and several other documents,” he said. 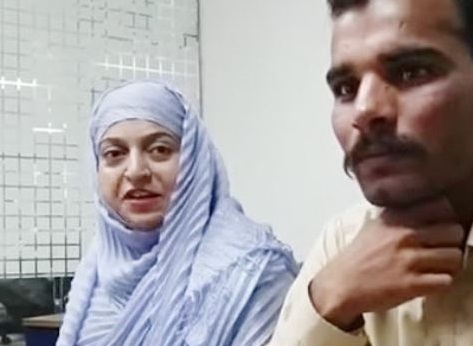 On the orders of the Lahore High Court (LHC), the ministry had summoned the Indian national and her Pakistani husband in Islamabad. The couple appeared before the Home Ministry on Monday where they had to wait for long due to the unavailability of the passport. When the authorities asked for the passport from the Indian woman before the visa extension, she said that the booklet was with the Evacuee Trust Property Board (ETPB). Her passport was needed for verification of the first visa. The ETPB shared that Amna’s passport had been given to the passport immigration authorities. However, after several attempts, the visa was verified. After the process, the approval for an extension in the visa for the next six months was granted. The Indian national is ecstatic over getting the visa. “I am hopeful of getting the Pakistani nationality too,” she said. According to the current laws, Pakistan and India grant nationality after seven years.